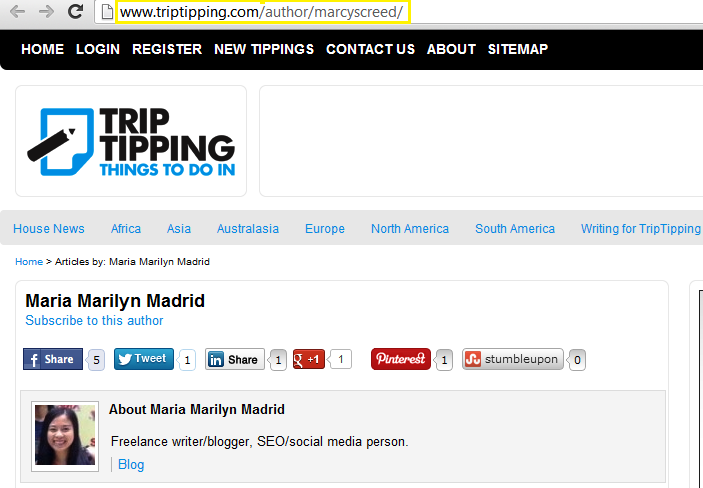 TripTipping.com as the site name implies is a travel tips website which offers trip tipping for travelers. Posts are published by writers and travelers the world over. But unlike other travel related websites, Trip Tipping offers actual tips, as if touring a location with a guide. There is a step by step guideline from sunrise to sunset and dusk to dawn about what you can do when at a certain place. Recently, my very first post was published on the site. See screenshot of my author page above. Although I only have one post so far, there are more upcoming posts currently pending for approval aside from those that I am working on at the moment and will soon submit. Whether you love to travel or not and have been to interested places, you can share about your escapades by contributing content on the site. If you have a blog or website, particularly a travel related one; you can grab the opportunity to link back to this relevant travel related site. You can establish a portfolio as a travel writer or generate added traffic for travel readers back to your blog or site. However, there are guidelines you need to follow when writing a post. Your article should be at least 300 to 400 words and must follow a pattern; city introduction, breakfast, morning, lunch, dinner, and evening. If you can provide high resolution photos, then do so. If not or if the site rejects your images, they can always find photos which will match your article. So if you’re ready to share your ideas on this travel tips website, visit this page to start writing for TripTipping.com.